Carpet is a textile floor covering that is distinguished from the more general term "rug" by being fixed to the floor surface and extending wall to wall. The earliest peoples covered the floors of their dwellings with animal skins, grass, or, later, woven reed mats. When people learned how to spin cotton and wool, woven mats of these materials largely replaced earlier coverings. Around 3000 B.C. Egyptians sewed brightly colored pieces of woolen cloth onto linen and placed it on their floors. The first carpets of note were woven by nomads. The thick carpets were easy to transport and were placed over the sand floor of tent dwellings. Early looms were similarly easy to transport. Two forked branches were joined by a crosspiece holding the suspended warp, and a wooden bar was used to flatten binding weft threads, while the loose warp ends formed the carpet's pile. The Pazyryk carpet has been documented as the earliest hand loom carpet, dating back from 500 B.C. and discovered in a tomb located in the Alti Mountains in Central Asia. From these early beginnings, carpet weaving rose to its highest art form in Turkey, Iran, India, and China. Using cotton, linen, or hemp as the foundation, and wool or silk as the luxurious pile, weavers would make a knot out of the pile thread, then form a row of knots that was tightly beaten down. The process was time-consuming: some of the finest handmade carpets have as many as 2,400 knots per square inch (372 knots per sq cm). The brilliant colors of these ancient carpets came from natural dyes such as madder, indigo, genista, woad, and ocher. Some weavers added alum to these dyes to fix the color, and a few wove gold and precious jewels into their carpets. While Europeans for centuries eagerly received carpets ready-made from the Middle East, carpet making itself did not find a firm foothold on the continent until France imported Moorish weavers around A.D. 1300. By 1600, carpet guilds were flourishing around Aubusson and Savonnerie. England also imported Persian weavers, as well as French ones, and by 1700 both Wilton and Axminster, known for their wool, were chartered carpet-making towns. Carpet making in Europe started with the "Brussels weave" in France and Flanders. This weave is formed by putting yarn over rods to create uncut loops. Wilton carpets are cut by a blade that replaces the rod in the Brussels weave. In 1801, Joseph M. Jacquard invented a device for handlooms that used punch cards to place up to six varieties of yarn colors in textiles, thus increasing production. This technique was adopted for carpet looms in 1825. The first carpet factory in the U.S. was built by William Sprague in Philadelphia in 1791. His looms, based on English inventions, could make 27-inch (69-cm) runners that could be sewn together to make larger carpets. By 1800, 6-8 yards (7-9 m) of carpet could be made in a day. Erastus Bigelow built a mill in 1825 in Clinton, Massachusetts, and invented the power loom in 1839, which doubled carpet production. He also invented the first broadloom in 1877. Power looms improved over the years; soon one loom could make 75 yards (82 m) of high quality carpet a day. Synthetic yarns arrive at the carpet manufacturer either in staple fiber form or bulk continuous filament form. The staple fibers, which average 7 inches long, are loose, individual strands that arrive in bales. Carpet production changed dramatically at the beginning of the 20th century, beginning inauspiciously with a burst of tufted bedspread production in Dalton, Georgia, led by young entrepreneur Catherine Evans Whitener. Tufting is the process of punching yarn into a ground fabric to create many uncut loops at a very fast pace. Tufted bed-spread factories dominated the Dalton area by World War II, and they soon began producing tufted rugs as well. Demand for these roughly made rugs was as great as that for the bedspreads. At first using cheap, readily available cotton before switching to synthetic yarns, the number of Dalton carpet makers grew as they produced great amounts of relatively easy-to-make broadloom tufted rugs and, eventually, carpets. Carpet, once a luxury, became affordable for most Americans. Today, carpet makes up 72% of all flooring, with tufted carpet being 91.5% of production, and the city of Dalton is responsible for over 70% of the world's production of carpet. Carpet consists of dyed pile yarns; a primary backing in which the yarns are sewn; a secondary backing that adds strength to the carpet; adhesive that binds the primary and secondary backings; and, in most cases, a cushion laid underneath the carpet to give it a softer, more luxurious feel. Ninety-seven percent of pile yarns today are made up of synthetic polymers; the rest of the yarns are wool and comprise the more expensive, woven carpet. Synthetics are plastics such as nylon (which is in 66% of all carpet), acrylics (15%), polyester (less than 15%), and polypropylene (less than 5%). These pile yarns are dyed using a variety of organic chemical compounds, or occasionally, organometallic complexes. Both the primary and secondary backing are largely made of woven or nonwoven polypropylene, though some secondary backing may still be made of jute, a natural fiber that, when woven, looks like burlap. The adhesive used to bind the backings together is almost universally synthetic rubber latex. The most common padding is rebond (bonded urethane), though various forms of synthetic latex, polyurethane, or vinyl might be used instead. Rebond is recycled scrap urethane that is chopped into uniformly sized pieces and pressed into layers. Although rare, some carpet cushioning is made up of horse hair or jute. A plastic top sheet is usually added to the top to insure a smooth surface against the carpet. Since most carpet in the U.S. is tufted; earlier methods of weaving carpet, such as Wilton and Axminster, are ignored in the following account. continuous filament form. The staple fibers, which average 7 inches (18 cm) long, are loose, individual strands that arrive in bales. Several bales are blended together into one batch in a hopper. Then, after lubrication, they are spun into long, loose ropes called slivers by a carding machine. The slivers are then pulled, straightened, and spun into single yarn that is wound onto spools. Both the single-ply staple fibers (now spun into filament) and the bulk continuous filament must now be twisted together to form thicker twoply yarn suitable for tufting. The yarns are then steamed to bulk them, and then heated to 270-280°F (132-138°C). This heat setting causes the yarn to maintain its shape by fixing its twist. After cooling, these yarns are wound onto tubes and transported to the tufting machines. through which treated dyes are circulated, or passing the fiber continuously through the bath, or passing skeins of yarn through the vat of dye. The yarn can also be put on forms, and the heated dyes can then be forced under pressure from inside the forms to color the yarn. Another method passes the yarn through printing rollers, while yet another involves knitting the yarn onto a form that is then printed with dyes before the yarn is unraveled. All yarn that has been dyed is then steamed, washed, and dried. 3 The yarn is put on a creel (a bar with skewers) behind the tufting machine, then fed into a nylon tube that leads to the tufting needle. The needle pierces the primary backing and pushes the yarn down into a loop. Photoelectric sensors control how deeply the needles plunge into the backing, so the height of the loops can be controlled. A looper, or flat hook, seizes and releases the loop of yarn while the needle pulls back up; the backing is shifted forward and the needle once more pierces the backing further on. To make cut pile, a looper facing the opposite direction is fitted with a knife that acts like a pair of scissors, snipping the loop. This process is carried out by several hundred needles (up to 1,200 across the 12 foot [3.7 ml width), and several hundred rows of stitches are carried out per minute. One tufting machine can thus produce several hundred square yards of carpet a day. 4 For solid color carpeting, carpet of several standard roll lengths is sewn together to make a continuous roll, which is then fed into a vat. The vat is filled with water, which is first heated before dyes and chemicals are mixed in. The mixture is then slowly brought to a boil and cooked for four hours. Another method of making solid color carpet is to sew several rows together to make one continuous roll, which is then fed under rods that bleed the color into the pile. After dyeing, the carpet is then steamed to fix the color, excess color is washed off, and the carpet is dried and put on a roll. 5 To make printed carpet of various designs, white carpet passes under screens in which holes in the desired pattern have been cut. The desired color is squeegeed through the holes in the screen, and the carpet is advanced 36 inches (91 cm) to a different screen that applies a new color in a different design through the screen. Up to eight colors can be applied with this method. 6 Another method of dyeing printed carpet is to pass it under embossed cylinders that have raised portions in a design, which press color into the carpet. Each cylinder provides a different design for a different color. After dyeing, the printed carpet is steamed, excess dyes are washed off, and the carpet is then dried and put onto rolls to go to the finishing department. 7 The ends of the dyed carpet are first sewn together to form a continuous belt. This belt is then rolled under a dispenser that spreads a coating of latex onto the bottom of the carpet. At the same time, a strong secondary backing is also coated with latex. Both of these are then rolled onto a marriage roller, which forms them into a sandwich and seals them together. The carpet is then placed in an oven to cure the latex. 8 The completed carpet is then steamed, brushed, vacuumed, and run through a machine that clips off any tufts that rise above its uniform surface. The carpet is then rolled into 120 foot (37 m) lengths that are then packaged in strong plastic and shipped to either the carpet manufacturer's inventory warehouse or to a retail carpet store. Every piece of carpet that is tufted is inspected to see if any tufts are missing. One person with a single needle tufting gun shoots pile yarn wherever holes are found. Each piece of carpet is then inspected. The manufacturer checks that the piece is of the proper dimensions and that the tuft height is of the desired length. The static shock potential is also tested. Most states require a flammability test. A prepared 9 × 9 inch (23 × 23 cm) specimen is placed on a steel plate that has a hole 8 inches (20 cm) in diameter in its middle. A methenamine tablet is ignited in the center. If the charred portion in seven out of eight trials does not reach to the circumference of the hole, the carpet passes. Another important test determines the carpet's resistance to wear. A specimen of carpet is placed in a drum and beaten with a steel ball that has rubber studs on it for 20,000 to 50,000 revolutions. The carpet should look fairly new after this test. To test how the carpet's color stands up to sunlight, a standard light source that simulates sunlight is directed at a specimen, which is then rated according to the number of units of exposure required to produce visible loss of color. The mass per unit area of pile yarn is a significant test because pile density determines the feel of the carpet. First, the synthetic yarn is removed from the carpet, either by physical means (it is ripped off the primary backing) or chemical means (it is dissolved off). The yarn is then dissolved in a solvent, then dried in an oven to remove the solvent. The dry residue is then weighed and checked to see if the mass is as specified for that type of carpet. Each type of synthetic fiber has its own recipe. Nylon, the most commonly used synthetic yarn, is dissolved in hydrochloric acid and dried 15 minutes at 77°F (25°C). Backing fabrics and carpet padding are tested for strength by being pulled in a vise until they break. The primary backing's strength is checked both before and after tufting. The delamination strength of the secondary backing is also tested by determining at what force the secondary backing can be pulled away from the primary backing. Part of the quality control process is up to the customer, who must select carpet of the proper strength and durability for the amount of traffic expected in the room, vacuum regularly, and have the carpet professionally deep cleaned at least once a year. Deaton, Thomas M. Bedspreads to Broadloom: The Story of the Tufted Carpet Industry. Tapestry Press, 1993. Ellis, Robert Y. The Complete Book of Floor Coverings. Charles Scribner's Sons, 1980. Garstein, A.S. 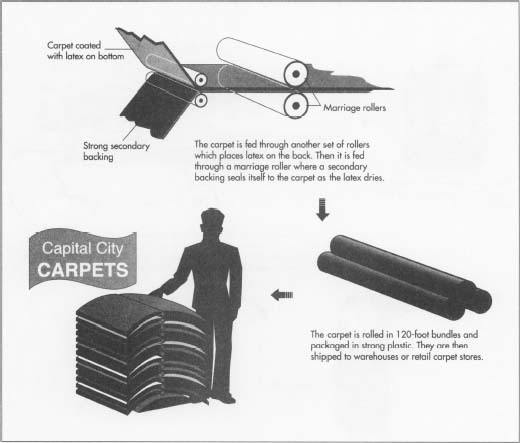 The How- To Handbook of Carpets. Van Nostrand Reinhold, 1979. Revere, Glenn. All About Carpets: A Consumer Guide. TAB Books, 1988. Shoshkes, Lila. Contract Carpeting. Billboard, 1974. Von Rosensteil, Helene. American Rugs & Carpets. William Morrow & Co., 1978. "New Technology in Carpeting." American Dyestuff Reporter, February 1992, p. 10. "Magic Carpets." The Economist, November 7, 1992, p. 108. "Carpet Machine Bonds Yarn to Backing Without Sewing." 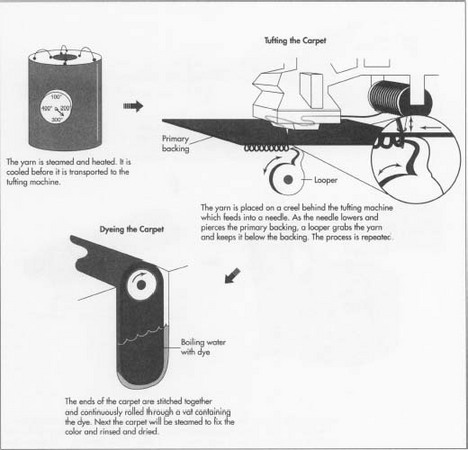 Machine Design, January 21, 1988, p. 56. "Floor Covering." Textile World, June 1993, p. 60+.